Zhengzhou Great Wall Company is the most authoritative portable diesel crusher manufacturers, diesel crusher technology is more advanced,portable diesel crushers are powered by diesel engine, which has stable performance. 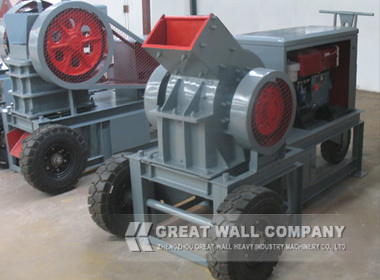 Great Wall mobile diesel crusher is the most development potential of the equipment on the mining machinery market, The mobile crusher models are PEC 1525 diesel jaw crusher,PEC 2540 diesel jaw crusher,PCC3040 diesel hammer crusher and PCC4060 diesel hammer crusher.If you want to keep diesel crusher good crushing performance you should do as the technical guidance. Great Wall stone crusher engineers also analysis and summarize working parameters in diesel crusher crushing process.The diesel crusher specifications contain maximum feeding size, adjustable output size range, motor power,diesel crusher weight,crusher overall dimension and crushing capacity per four etc.,If you are interested in our diesel crusher price and flow chart, Great Wall diesel crusher manufacturer will send you most favorable quote,picture,CAD and foundation figure. Welcome to send your suggestions to us, we will try our efforts to meet our client's requirement.